Rated the #1 Stargazing Destination in America by USA Today. Tonopah has incredible night skies. In most cities you can see between 25-50 stars, in Tonopah you can see 7,000! Have you ever seen the Milky Way, along with thousands of stars? 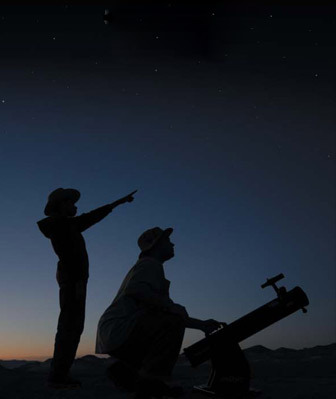 In Tonopah you can just by looking up at our incredibly dark night skies – no equipment required, just your eyes! The stars are gorgeous every clear night, but moonless nights are always the best for stargazing. Prepare to have our fantastic night skies take your breath away! 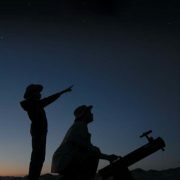 Visit the Clair Blackburn Memorial Stargazing Park – located at the end of Ray Tennant Drive (turn by the Tonopah High School and follow the pavement until it turns to dirt road – keep on going straight and you will see it right in front of you). Designed for professional astronomers as well as anyone with an interest in the stars, you can set up a telescope on one of our cement pads or just sit at the picnic tables and look up. We offer a night photography workshop during the summer – keep an eye on our website and Facebook page for dates!